It's crazy to think how, in just a few short years, our lives can change so much. In early 2015, we had never heard of dragon boats and didn't know much about the families in our community who were struggling or how End Hunger in Calvert County was helping. We had no idea that a fundraiser in North Beach would become so important to us and help us heal as a team, year after year. Looking back at our first End Hunger Dragon Boat Festival, we seriously did not know what we were getting into. When our captain, Kayla, pitched the idea, the initial response was "Wait... a boat costs WHAT??" In her calm but assertive voice, Kayla explained the paddler fee breakdown and the unique opportunity to help thousands of people... suddenly that registration fee wasn't so intimidating. We immediately got to work doing what we do best—picking fantastic nautical names for things we love—and Mussels & Mermaids was born! The more details we got about this new festival, the more excited we got. Decorating a tent, dressing someone up like a mermaid, and convincing the guys on the team to wear tiny sailor hats were all in our wheelhouse. The energy around this event was electric and we couldn’t wait to be a part of it. The day came and went. We finished 11th overall but were already planning for next year’s races. We focused on strategies to up our game across the board: keeping our paddlers in sync, using a nautical backdrop for the tent, painting “scales” on ourselves with stage makeup and fishnet stockings, creating a bodice out of shells… you know, normal athletic stuff. Just when we were starting to plan for our team’s second year, we lost Kayla and her husband in a tragic accident. This amazing person who was so passionate about rallying our small team to help our larger community was gone. We paddled that year in our captain’s honor. We finished 6th overall but Mussels & Mermaids was presented with the Hill Climber Award, recognizing the year’s challenges. 2017 was better. We were healing as a family and coming together as a team. 2017 was our year. We finished 1st overall and finally took home that trophy! They say all good things must come to an end, however. 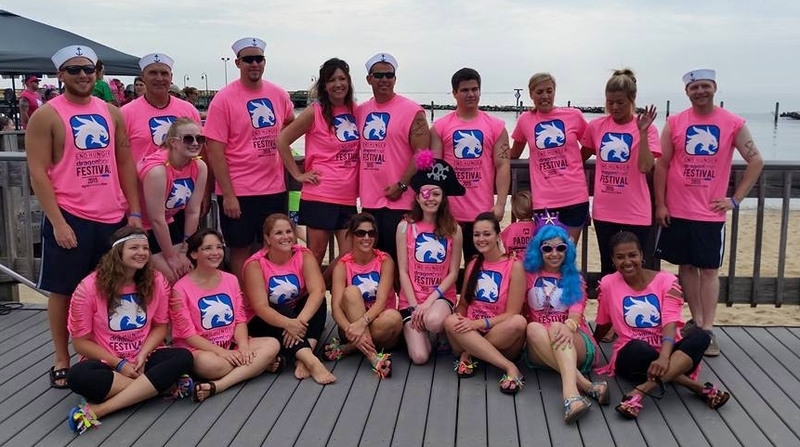 As much as we loved reigning as Dragon Boat champs, we know how hard it was to get here. Any team who can rally their friends, raise the money, commit to practice, and spend all day paddling to beat out 32 other boats deserves that trophy. We are honored to be a part of this unbelievable community that strives to make a difference in the lives of our neighbors. Kayla is why we started this and she’s a huge part of why we continue. Setting an example of service is something we can all do… you never know who you’ll inspire.